HDIM 2018: What representatives of Belarusian NGOs told in Warsaw? On September 12, Warsaw hosted a side event on the current situation of civil and political rights in Belarus. The event entitled “The current situation of civil and political rights in Belarus: first-hand information from inside" was held in the framework of the OSCE Human Dimension Implementation Meeting (HDIM 2018). 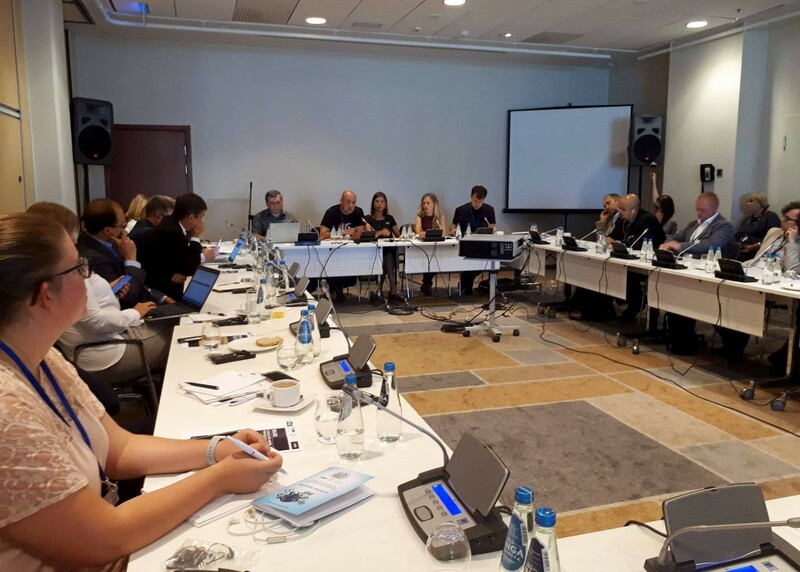 It brought together representatives of the International Federation for Human Rights (FIDH), the Assembly of Democratic NGOs of Belarus, the Human Rights Center "Viasna", the Legal Transformation Center and the Belarusian Association of Journalists. Yury Chavusau of the NGO Assembly gave an overview of the situation of civil and political rights in Belarus. He noted that the country demonstrates quite a paradoxical situation when the government reports on fulfilling its international obligations, even adopting an Inter-ministerial Plan on Human Rights. But what the human rights activists see is quite the opposite: there are no significant changes in the legislation or they are totally insufficient, and human rights are systematically violated. Chairman of the Belarusian Association of Journalists Andrei Bastunets spoke about the latest developments in the field of media, in particular on the new criminal charges against journalists and editors. Bastunets also focused on changes in media legislation to be adopted in the near future. A representative of the Legal Transformation Center Volha Smalianka told about the situation with the right to freedom of association. In particular, she spoke about the possibility of the decriminalization of Article 193.1 of the Criminal Code and the replacement of punishment with administrative responsibility. The human rights activist stressed that such changes are not acceptable, as in this case, the right to freedom of association will continue to be grossly violated for the human rights community. The human rights defenders stress that the prohibition of any activity of unregistered NGOs in general should be eliminated, as well as criminal or administrative responsibility for their activities. Volha Smalianka also elaborated on the issue of access to funding, including foreign, for civil society organizations. According to the human rights activists, this is a systemic problem which makes the organizations highly vulnerable. One of the latest examples is the case of Henadz Fiadynich and Ihar Komlik. Valiantsin Stefanovich, member of the Board of the Human Rights Center "Viasna", in turn, developed the subject of the trade union case and told about the circumstances of the trial of Fiadynich and Komlik. He noted that the trial exposed the flawed evidence. In fact, all the evidence was built around a single document of unknown origin, which was reportedly found in an electronic mailbox, whose origin and ownership have not been established during investigation and the trial. In his speech, Stefanovich also spoke about the new law on mass events, which preserved all the points that were criticized by human rights defenders. In addition, Valiantsin Stefanovich told about the latest developments with executions in Belarus, namely the decision of the UN Human Rights Committee on Aliaksandr Hrunou, which became the seventh decision by the Committee to find a violation of the right to life by the Belarusian state. The human rights activist emphasized that the latest known execution (Aliaksei Mikhalenia) was enforced in violation of the interim measures applied after the registration of his complaint by the Committee. Julia Ouahnon of the International Federation for Human Rights (FIDH) told about the situation of lawyers. She brought to Warsaw a report prepared by the Observatory for the Protection of Human Rights Defenders in cooperation with the Paris Bar Association and the Human Rights Center "Viasna", in which criticizes the Belarusian legislation allowing the executive branch to control defense lawyers.